Hair extensions are used to provide instant length, fullness, and protection to and for your natural hair. Some people consider hair extensions as a protective style because, it protects your hair from heat or chemical processing., and allows you to take a break from doing harsh treatments to your hair. This article will show you how to choose the best hair extension for your lifestyle. Hair extensions have become one of the most lavish salon services available due to the ability to add length and volume and even chemical-free highlights within minutes to hours. But choosing a hair extension can be overwhelming as there are so many options available. When choosing a hair extension, you should consider your hair type, lifestyle, and of course your budget. One of the oldest and latest hair extension styles is the Keratin tip hair extension which is also referred to as a fusion extension. This style of hair extension involves bonding individual hair strands. The Keratin tip hair extension can be applied using two types of methods that include hot fusion and cold fusion. These fusion extensions are considered Semi-permanent due to the long-lasting result (last up to 6 months) and have become very popular. It is great for people who are also getting scalp treatments done. Fusion extensions can be done on any hair texture and take the longest to apply, due to the strand-by-strand technique that is used to apply them. In this strand by strand method, a hot tool is attached at the base of the Keratin tip hair extension and is applied to your natural hair in small bundles with a hot keratin adhesive that is gentler on your hair than regular glue. These hot fusion hair extensions take about 2-6 hours to apply and can last up to 6 months. You can do many hairstyles like an up do or even style your hair down. It is great for people who are also getting scalp treatments done, or want damage-free highlights. This strand by strand method is applied by using weaving tools and pliers to weave small bundles of hair through a Micro-bead or Nano-bead. Cold fusion extensions are an alternative for Keratin hot fusion hair extensions and are a gentler method for hot fusion hair extensions. It is great for people who are also getting scalp treatments done. Pros: No heat is needed to apply them, if you are concerned about heat applications. Durability: Last 3 – 4 months, Things can get tangled as your own hair starts to grow,if you do not maintain them properly. This type of hair extension is considered a semi-permanent hair extension technique since they are sewn in. They can be tied by hand to secure the weft and are usually applied about 2-4 inches wide and applied in rows. 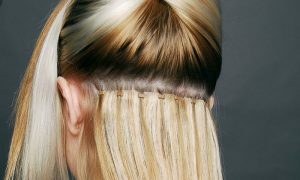 Weft extensions can be applied using glue-in, tape-in, sewn-in or braided. They typically last for 1-3 months. Durability: Last 1 – 3 months, Depends on the quality of the hair and whether or not your own hair can handle the weight of the extensions. However, salon visits every six to eight weeks are highly advisable. 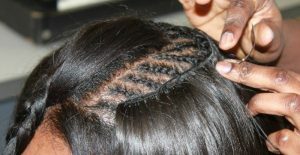 For the braidless or micro-weft application the weft is attached to the hair using micro-link beads. This technique is good for all hair textures, and is usually a faster installation process. All of the natural hair is left out, allowing the scalp to breath. It is great for people who are also getting scalp treatments done. 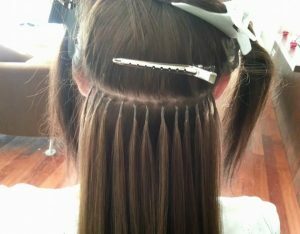 This hair extension method is where glue has applied the bottom of the weft and attached to the hair. This type of weft will stay in for a few days and can be removed using oil-based solvent. It is not the healthiest extension application. 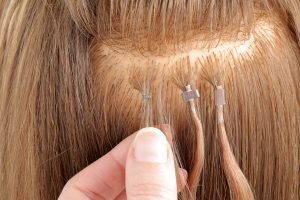 This method is one of the newest forms of hair extensions and is applied using polyurethane tape single or double-sided. Clients with very thin hair require single panel hair extensions. Tape-in extensions can be used on any hair texture. With the double-sided tape, the weft is applied after the backing has been removed and the other piece of weft is applied on the other side of the tape for the double-sided or “sandwich” effect. This type of hair extension method is one of the fastest applications that can take 20-30 minutes if you are looking to add volume to your hair, or 45 minutes to an hour for a full-length application. 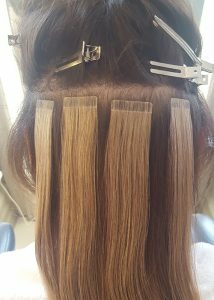 Tape-in hair extensions is one of the safest methods since the weight of the hair is spread evenly and can last up to 8 weeks. It is great for people who are also getting scalp treatments done. Durability: Last 1 – 4 months, Things can get tangled as your own hair starts to grow, but they’ll be good for up to four months. This hair extension is known as a weave and is usually applied on curly, coarse or thick hair. The hair is braided, and the wefts are sewn into the braids using a needle and thread. If installed incorrectly this technique can damage and pull out your natural hair, especially the edges. When it comes to purchasing hair, you get what you pay for. Price will vary greatly based on quality of the hair, as well as the desired quantity (for thickness) and length. Virgin (never-before-processed) Remy human hair is the highest quality and runs upwards of several hundred dollars per bunch, and you will require more than one. “The hair cuticle is preserved, instead of stripped, and all the hairs run in the same direction, maintaining a natural, soft, silky texture,” says Zola. Synthetic hair is much cheaper but won’t blend or style the way human hair does. Synthetic hair does not last as long as human hair and is not reusable. Extension hair should be cared for just like your natural hair: gently. After washing, make sure it is dried thoroughly to, avoid tugging or yanking at the extensions while brushing. Instead, hold hair at the root, and begin detangling starting at the ends. You can use all of your favorite hair products, but keep oils away from the roots in order to prevent the bond, tape, or weave from slipping. “At bedtime, put your hair in a loose braid or up in a high bun so it doesn’t get matted or tangled while you sleep,” recommends Zola.